To get ready for GHS, many companies today are designing label formats for their drums. 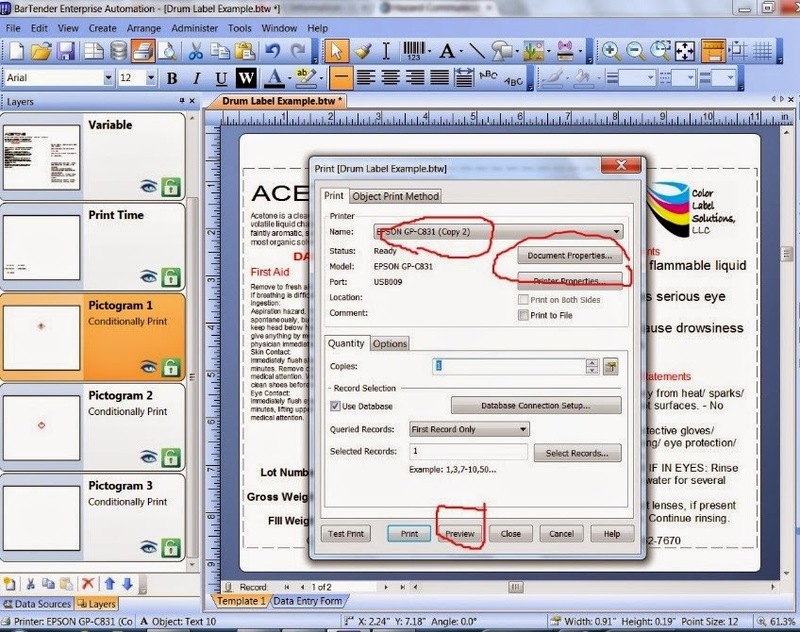 One means to optimize your label designs is to use label design software that enables you to connect to a database to import variable data. 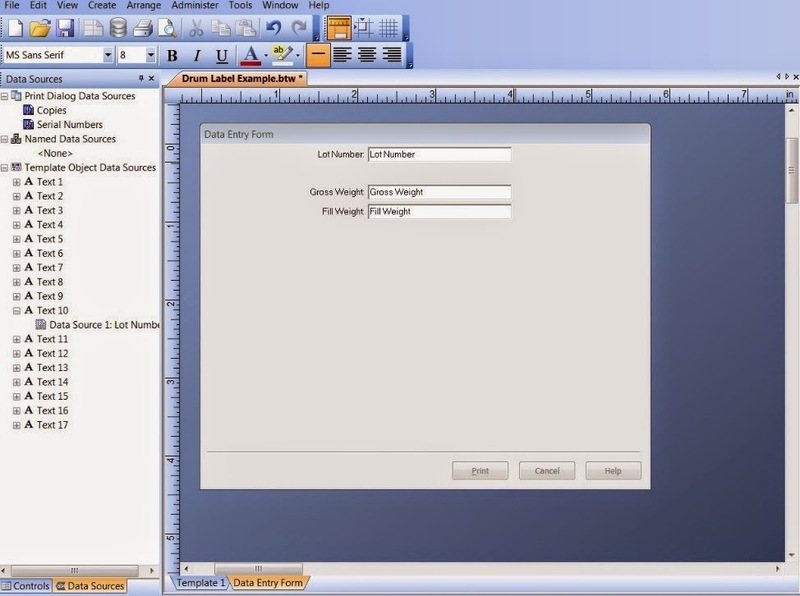 In this post, I’ll show you how to use an example database and drum label format. You can get the example BarTender format and Database here from our website, http://ghs.solutions/ghs-label-template-database.html. 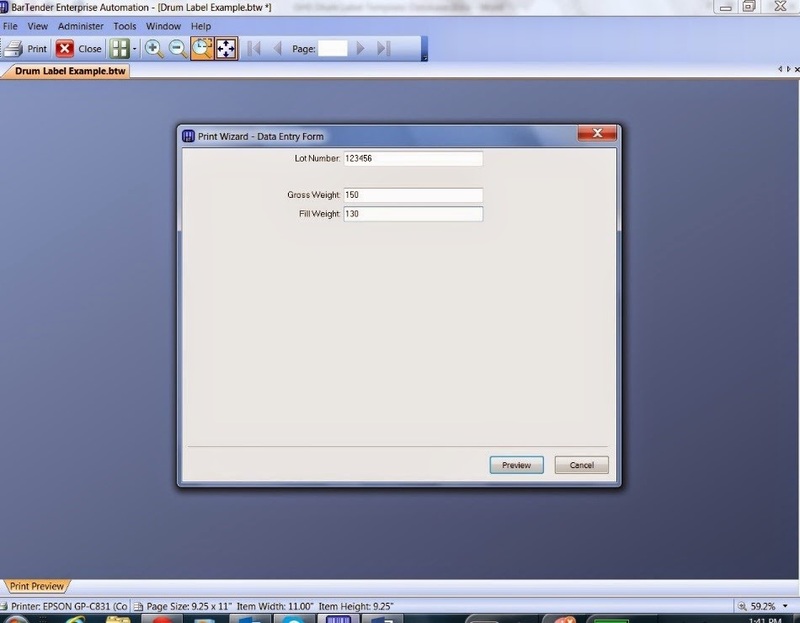 To use the GHS Drum Label Template and Database, you first need to download BarTender software from Seagull Scientific. You can use this software for 30 days prior to purchase. 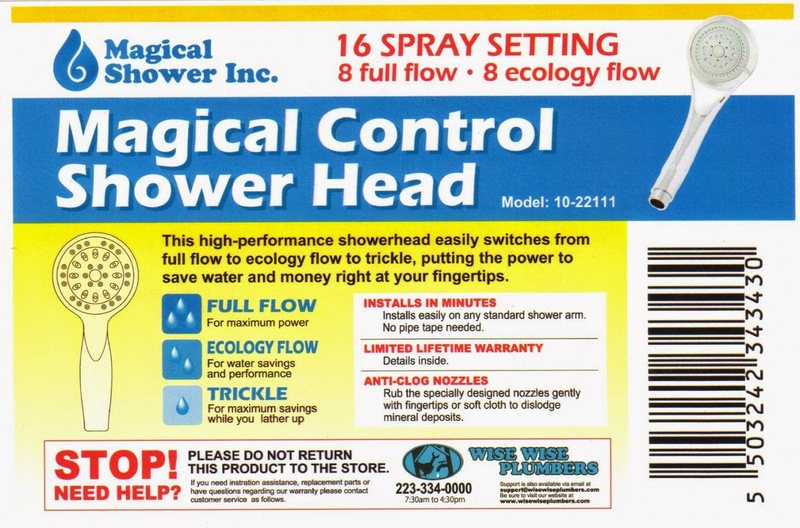 Download the software here: http://www.seagullscientific.com/label-software/barcode-label-printing-software-download.aspx. For this label design project, we assume the user has a basic understanding of BarTender; or is willing to learn. Feel free to add other categories of information into your database: such as Additional Information, Ingredients, etc. You can easily add these other fields of data to your label later. While adding the data to the Excel database, be sure to insert the correct formatting of the statements, especially carriage returns. To insure a carriage return, press the Alt key and Enter key together. Next set up a directory (i.e. C:\Users\Guy Mikel\Documents\GHS\Pictograms) containing the GHS pictograms you require for your labels. You can download all of the GHS pictograms here: https://www.osha.gov/dsg/hazcom/pictograms/. 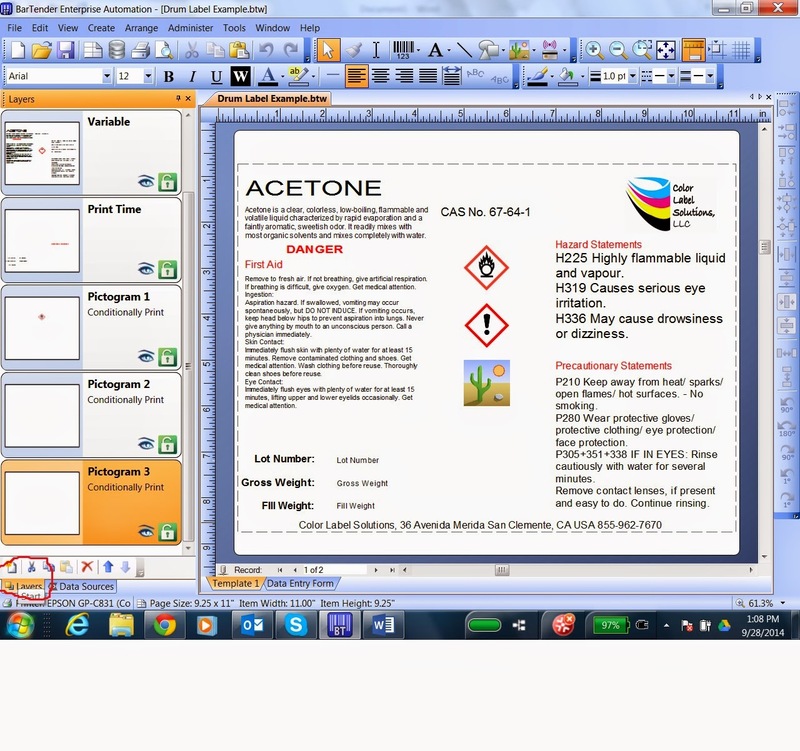 In your database, edit the directory path for each pictogram required for each product. Once the data is added, be sure to save the database to the same location as the BarTender file. Then close it. You can’t edit the database once BarTender is opened. Be sure to review BarTender basics to insure you have the correct printer and page layout selected. 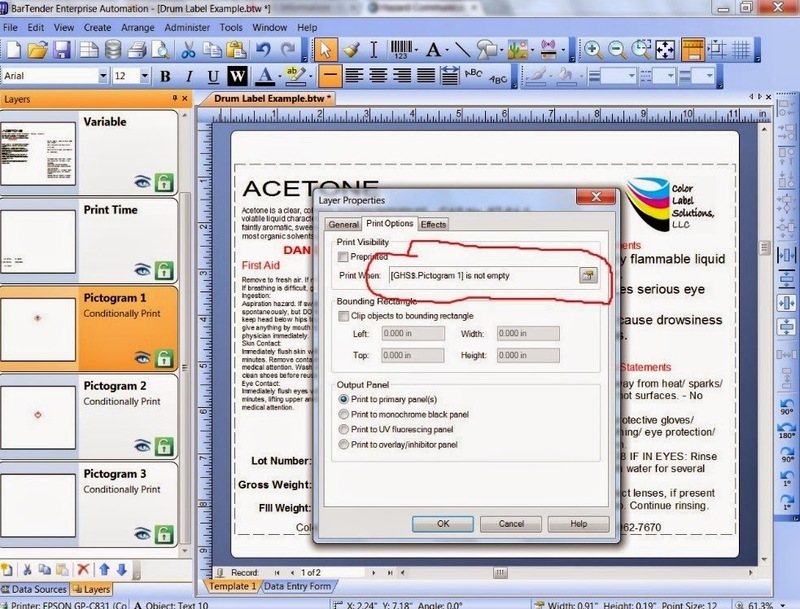 Also know; all text is selected to adjust the print fonts to maintain the box size. In BarTender, click on “Layers” tab in the bottom right section to see the various layers of the label template. On the Embedded layer, right click and select “Show Only This Layer”. In this layer, replace the logo file by right clicking, selecting properties, selecting “Picture: on the left side of the Properties dialog box, and selecting “file” to upload your logo. Also, replace your address information by selecting the address box, right clicking and selecting “Properties”, selecting “Data Source”, and changing the address information. Next select the Variable layer, right click and select “Show Only This Layer”. This layer will contain the information you’ve added to the database. Move these text boxes around the template to fit your specific requirements and aesthetics. Once finished, right click again on the Variable layer and select show all. 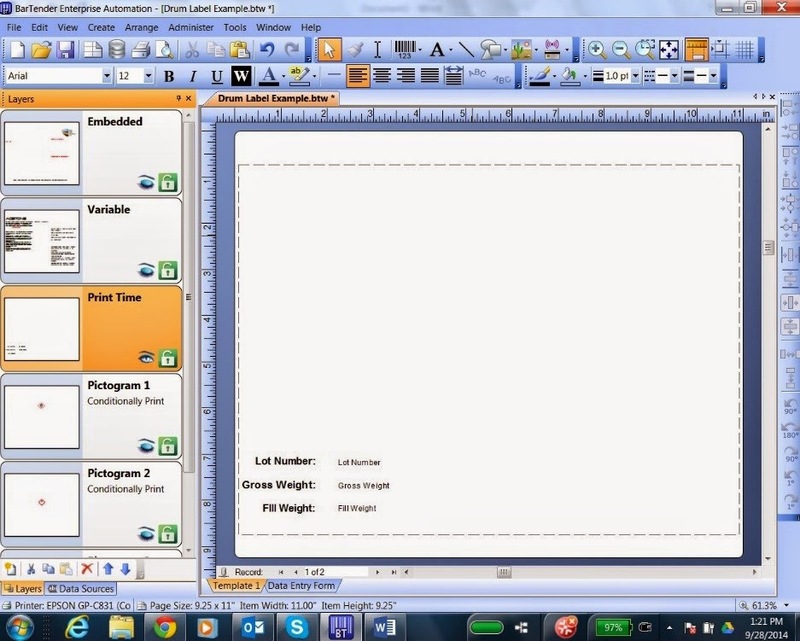 Then select the Print Time layer, right click to select "Show Only This Layer". Here will have the print time data that can be added prior to a print job. If you do not want to have this data added at print time, just delete the boxes. To add other information such as Fill Date, Expiration Date, Fill Location, etc, just copy the pair of boxes, right click on the variable data text box, select properties, select data source, select transforms, and click on Data Entry Control. In this dialog box, you will need to add the correct type of data to enter. 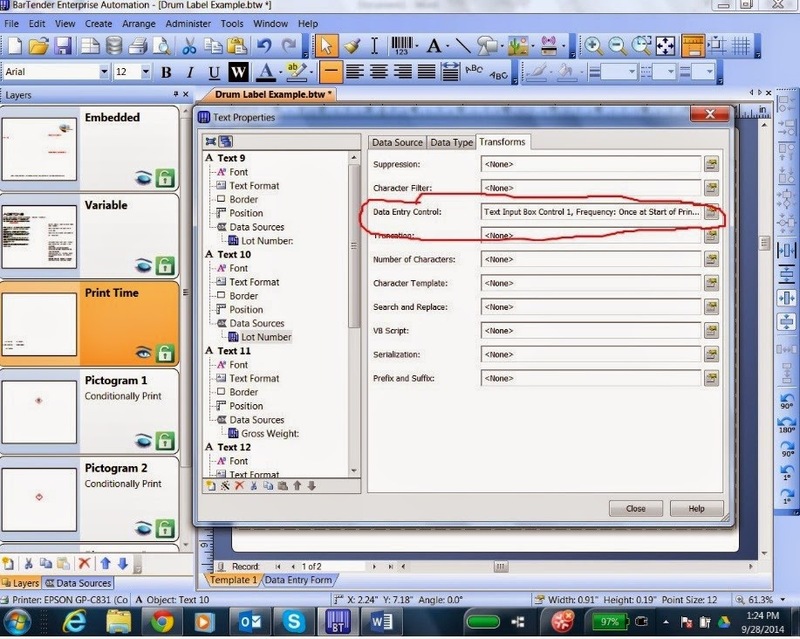 At print time, the operator will need to add the data prior to printing. 3 more layers exist in this template: Pictogram 1, 2 and 3. These are set to print only if data is added to the database. To confirm or change, right click on a “Pictogram” layer and select properties. In properties, select print options and change as required. 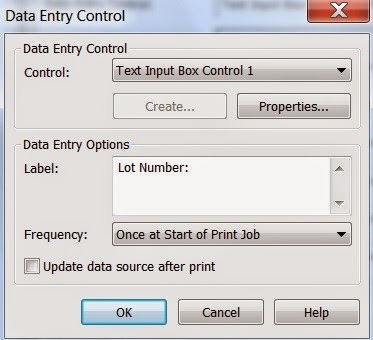 When you select print preview, the print time data entry will open. Add the variable data to continue to the print job. Please know you’ll probably need to make changes to the template to fit your requirements and aesthetics. Add other colors, images, etc. to improve the look of your label. If you need assistance, contact Color Label Solutions at 855-962-7670. We’ll be happy to assist you design and print your GHS Drum labels. Our goal is to make printing GHS Labels a quick and painless process. Do you need to print GHS drum labels in a roll to place them on an applicator? 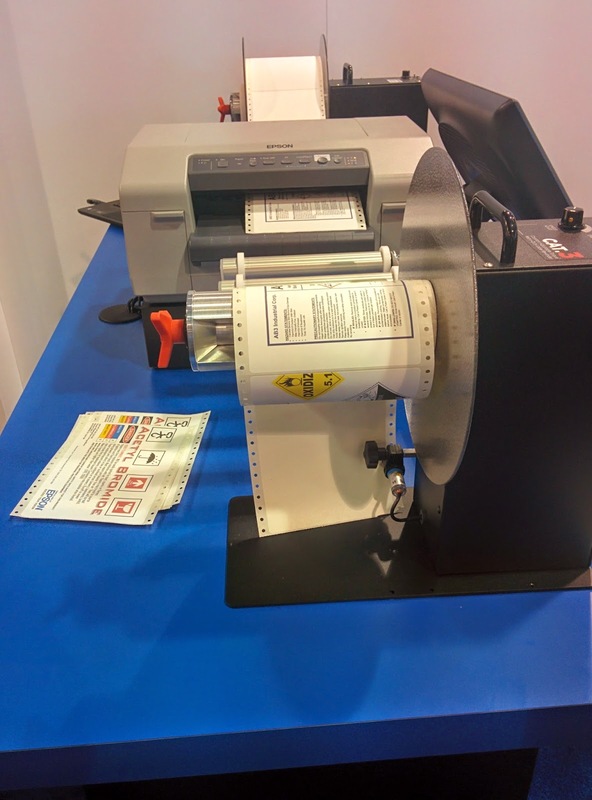 While visiting Label Expo, http://www.labelexpo-americas.com/, I saw the best option currently available for producing GHS drum labels on a roll; the GP-C831 with a winder solution from Labelmate. Watch the video of this solution running on my YouTube channel. I asked Stuart Ripplinger of Labelmate, http://labelmateusa.com/#&panel1-1, the manufacturer of this new solution, why this system works better than standard winders for the GP-C831. According to Stuart, “the new ELU Loop Unwinders and ELR Loop Rewinders have been created for very sensitive printers; that do not work well with the tension that exists between the printer and the Rewinder/Unwinder. When even the weight of a dancer arm resting on the material is too much, you may now use the ELU/ELR units for no tension whatsoever on the printer." As you can see in the picture and video, I asked Stuart if the tractor feed on either side of the labels affected the winders. Stuart said, “tractor feed holes on the liner makes no difference when rewinding/unwinding with this system. In addition, ELU/ELR units are able to rewind/unwind perforated liners without any problems.” In some situations, I can imagine having perforations on liners, and still wanting to rewind, may be of interest. 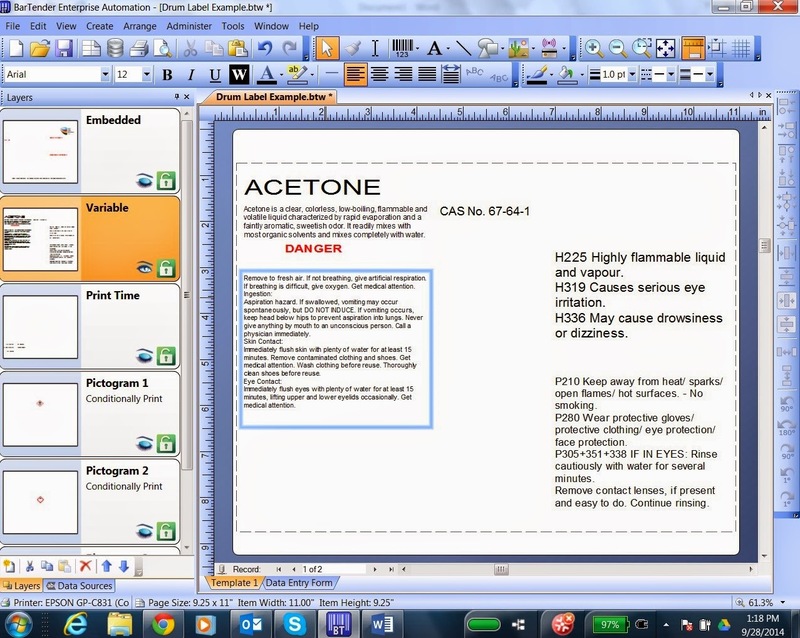 Alternatives do exist to this system, including laser printers from QLS, the Vivo (http://www.quicklabel.com/products-services/label-printers/color/vivo-touch.html), from iSys (http://www.isys-label.com/products/edge-850/index.html), and from Neuralog (http://www.neuralog.com/pages/NeuraLabel-Printer.html). All of these printers are sheet-fed laser or LED printers converted to continuous, roll-fed label printers. As the print engines were designed as sheet fed, you always waste labels at the end of each print job. Recently, I visited a company that lost 2, 14” labels at the start of a print job; plus an additional 2, 14” labels at the end of each print job. Wasting 4 large labels on every print job really costs a lot of money. 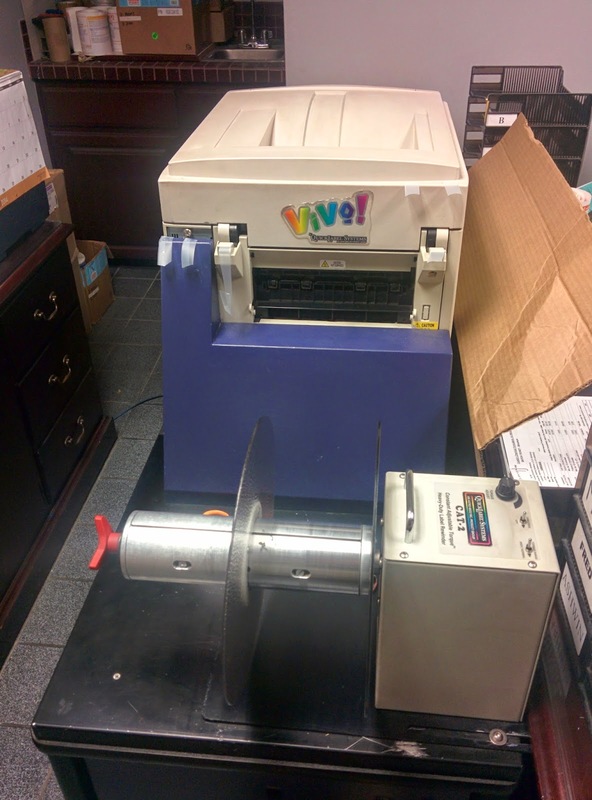 With the cost of wasting labels and the incremental cost of toner, I don’t recommend these printers for applications involving rewinding GHS drum labels. If you need a means to produce GHS labels for your drums, contact us to learn more about this winding solution. 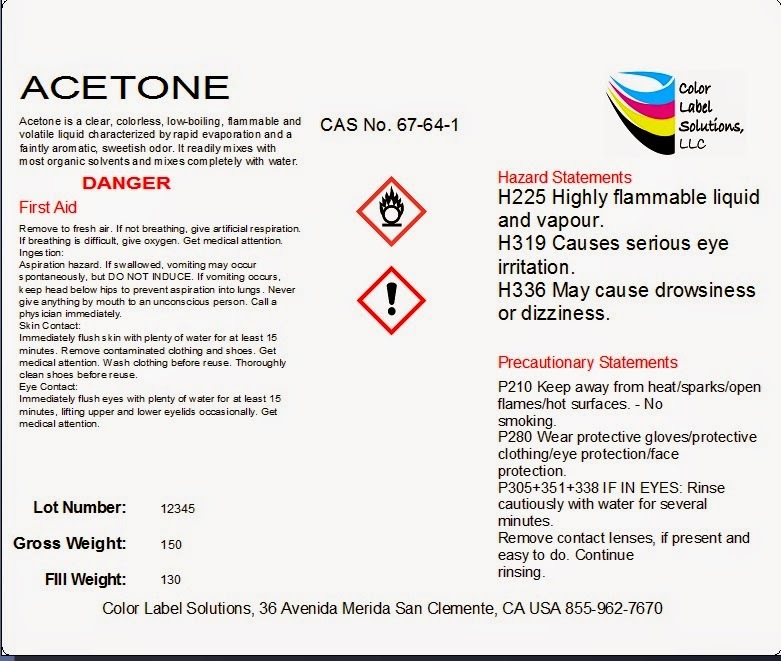 We’ll make your move to printing color labels on-demand easy. Akorn (www.akorn.com) is a niche generic pharmaceutical company engaged in the development, manufacture and marketing of multi-source and branded pharmaceutical products in the areas of ophthalmology, antidotes, anti-infectives, and controlled substances for pain management and anesthesia in the United States and across the globe. In the past, Akorn purchased preprinted labels, stored them in inventory and printed the variable data with a serial matrix, pin fed printer. “Purchasing thousands of labels in different colors was a real pain. We had red labels for Quarantined, green for Released, orange for On Hold and blue for Sterilized. Every time we need new labels, we have to reload the printer in the printer, print and then hand stamp to record who made the decided on quarantining or releasing the inventory. Hand stamping was a particularly cumbersome manual process. Or we would have to manually fill in the variable information” says Rick. To improve this process, Rick started to look for way to print color labels on demand; which led to our paths crossing. 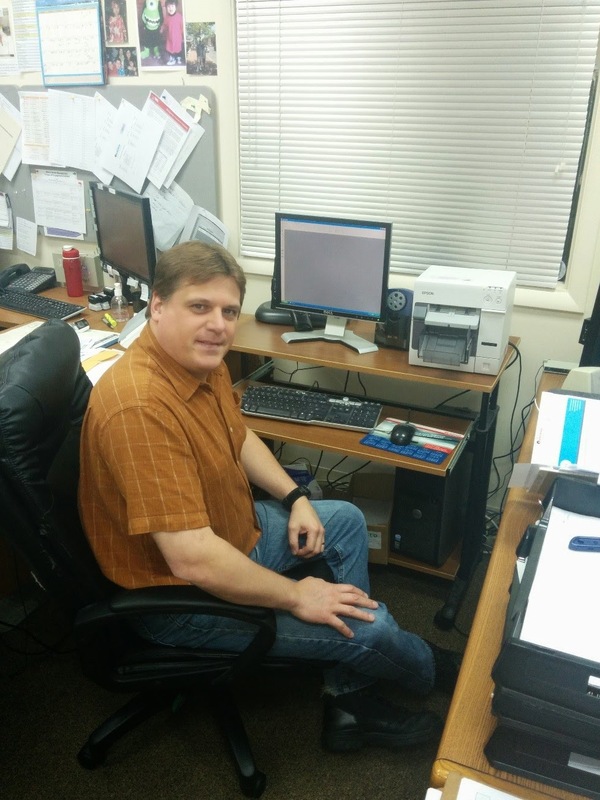 Initially Rick purchased a TM-C3400 printer, labels and Label Flow (http://www.jollytech.com/products/label-flow/index.php) from Jolly Technologies. With IT support from Fausto Tavarez, Network Administrator, Akorn developed a process to produce the various labels only when needed. In addition, Fausto included a system to stamp who approved the quarantine or release of the product right on the label automatically. After Rick and his team has started using the print on-demand color label solution, Akorn India has contacted me to duplicate the setup. 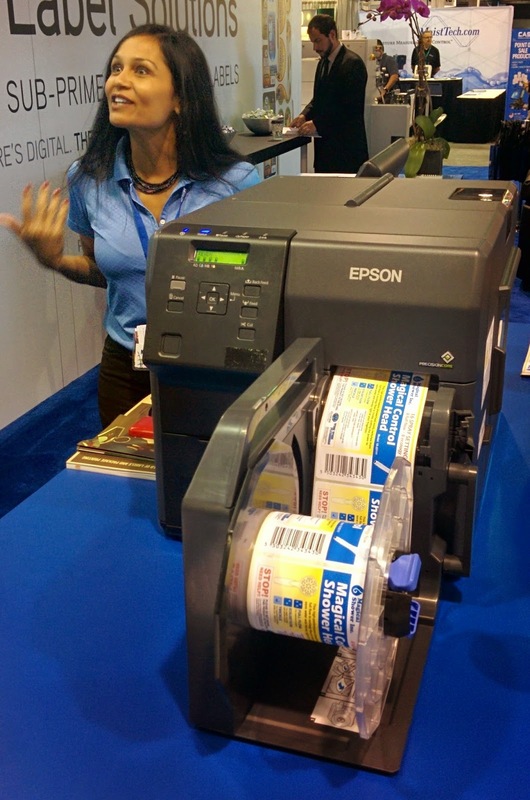 However, Epson has not released the TM-C3500 in this country as yet. If you need to label your raw material or work-in-process inventory similar to Akorn, learn from them. We can help you build and integrate a print on-demand color label process in your plant as well.